QaardZ is played on a 10 x 10 grid unit board with 50 'tiles' or 'qaardz' from a randomly generated 'pot'. Each player takes it in turn to score points by playing 'hands' or multiple 'hands' using tiles from their 'rack'. After each 'move' any tiles which have been played are replaced with randomly generated tiles from the pot. A game is complete when the pot is empty and one of the players has played the last of their tiles. The winner is then the player with the highest total game score. Standard games can be initiated by sending invitations to random opponents, friends or players found using the 'search' page. NOTE: There is a maximum limit of 4 standard games and 4 invitations at any one time unless the player upgrades to the 'premium' account. Upgrade to 'premium' account allows maximum of 20 standard games and 20 invitations at any one time. Games will also expire if neither player plays a move for 24 hours and the last player to have played a move will be deemed the winner. Tournament games are initiated by joining free or paid entry tournaments and QaardZ automatically randomly assigns opponents from available players in the tournament. 1Games Button - return to 'games' page. 2Game Status - current or final state of game. 3Player 1 Name - username of game player 1. 4Player 1 Score - current game score for player 1. 5Next Player Indicator - highlights next player to play (if any). 6Last Move - last move player info (if any). 7Player 2 Name - username of game player 2. 8Player 2 Score - current game score of player 2. 9Context Menu - popup menu with global and game specific menu options. 10The Board - the 10 x 10 grid of the game board play area. 11Current Move - highlighted tiles involved in current player move. 12Rack Tiles - tiles belonging to current player. 13Move Score - calculated move score for current move. 14Tiles Left - number of tiles left in the game pot. 16The Rack - container for tiles belonging to current player. 17Resign Game - resign (and lose) current game (disabled if not current player's go). 18Play Move - play currently highlighted move tiles (disabled if no move or not current player's go). 19Undo Move - recall currently highlighted move tiles from board and place back in rack. 20Skip Move - skip a move and allow other player to play again (disabled if not current player's go). 21Swap Tiles - return rack tiles to pot and receive random replacements (disabled if not enough tiles left in pot or not current player's go). 22Invalid Move Tiles - highlighted (in red) tiles which are illegally placed on board during current move. 23Invalid Move - replaces Move Score with Invalid Move message to indicate that currently placed tiled are illegally placed. 24Tournament Button - if this game is a tournament game then go to tournament page. This button replaces the resign button for tournament games since tournament games cannot be resigned. If the game is a standard game and it is not current player's go the resign button will be disabled. 25New Chat Messages Badge - shows number of unread chat messages in this game (if any). Moves are played by dragging tiles from the rack and placing them on the board to make valid hands. Tiles can also be rotated either on the board or in the rack by simply tapping the tile. This is how alternative edge colour matches can be created for higher scores. If the tiles placed on the board produce valid hands then those hands will be highlighted with a white outline and the move score will be calculated and displayed. If the tile placements are illegal then an invalid move message will be displayed and the illegally placed tiles will be highlighted with a red outline. QaardZ valid hands are a subset of traditional poker hands, 'pair', '2 pair', '3 of a kind', '4 of a kind', '3 straight', '4 straight' and 'full house'. For hands which have a sequence, e.g. '3 Straight' or '4 Straight' they can be played in any direction on the board, left to right, right to left, upwards or downwards. Hands do not need to match on colour or suit but if they do then this is explained in the Score Calculation section. 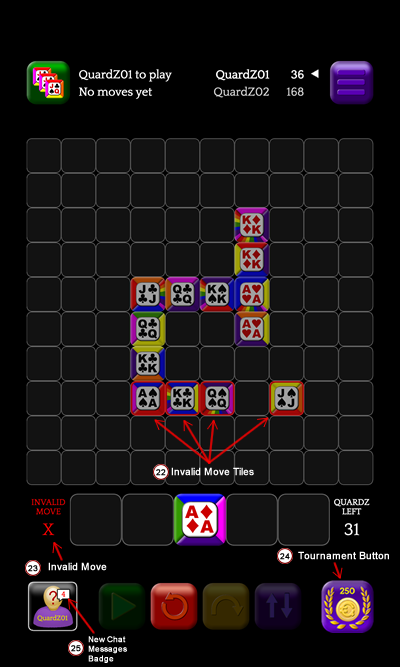 Having placed tiles on the board to create valid hands the move can be 'played' or submitted. If it is your go press the play button to submit your move. If you have chosen 'Play Move Confirm?' in your 'settings' then a popup will appear to confirm the move. Before 'playing' a move it is possible to 'recall' or 'undo' the current move. Press the undo button to return your currently played move tiles to your rack. If you cannot play a move or choose strategically to skip a move you can pass the play back to your opponent. Skipping moves can also prevent the game getting into a 'stalemate' situation where neither player can play a move. NOTE: If, in conjunction with the other play there are 3 skips in a row then the game is ended with the winner being decided according to the current player scores. If it is your go press the skip button to pass the play back to your opponent. A confirmation popup will appear to confirm the move. If you cannot play a move or you don't have particularly good tiles in your rack you can choose to swap your tiles. Swapping tiles can also prevent the game getting into a 'stalemate' situation where neither player can play a move. NOTE: This option is only available if there are tiles left in the pot. All tiles in your rack are returned to the pot and new random tiles are generated. If it is your go press the swap button to swap your tiles for new ones. A confirmation popup will appear to confirm the move. If you do not wish to continue in a game you can resign which will always cause you to lose the game irrespective of the player scores. NOTE: Only 'standard' games can be resigned. Tournament games cannot be resigned and the resign button will be replaced by a 'tournament' button. If it is your go press the resign button to resign the game. A confirmation popup will appear to confirm the resignation. Tiles can be rotated whilst in the rack or on the board by simply tapping the tile instead of dragging. The tile's edge colours will rotate through 90 degrees each time the tile is tapped as shown below. The first consideration is the 'base' score of the hand assuming that the hand is a valid hand. This is based on the total of the individual card values. The score of a hand can be improved by having 'matching' cards within the hand. The cards can match on colour, suit and exact card. The matching cards multiplier has a default value of 1 so therefore has no effect.The multiplier is then adjusted depending on which sort of card match is present. NOTE: Only 1 of the following 3 multipliers will be applied, they are not cumulative. If a hand's cards match on colour the base hand score is multiplied by 2. If a hand's cards match on suit the base hand score is multiplied by 3. If a hand's cards are an exact match, i.e. all cards in hand are the same card symbol AND suit then the base hand score is multiplied by 4. NOTE: This can only happen with hands which are by definition all the same card, i.e. 'pair', '3 of a kind' and '4 of a kind'. The edge multiplier starts off at a value of 1 so therefore has no effect. For each pair of edges which match, this edge multiplier is increased by 1. The 'rainbow' colour edge is a 'wildcard' and will match any other colour and increases the edge multiplier by 1 in the same way as a standard colour match. NOTE: If a 'rainbow' edge is matched to another 'rainbow' edge this adds 2 to the edge multiplier. This edge multiplier is then multiplied by the hand score so far after the 'base hand score' has been multiplied by the 'matching card multiplier' to arrive at the final hand score. NOTE: Only newly matching edges created by the current move tiles being played count in the edge multiplier. Existing matching edges between tiles already on the board do NOT count in the multiplier. 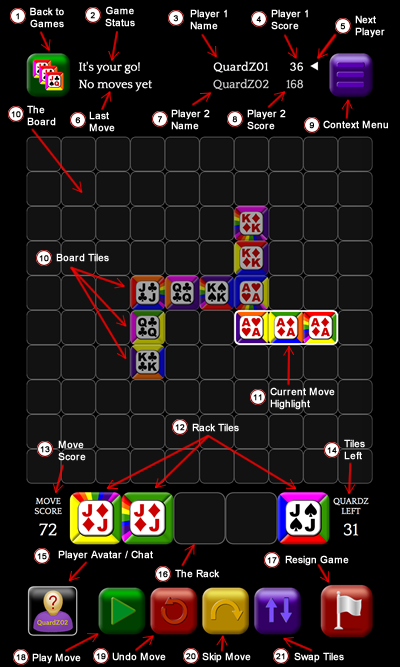 It is possible to create multiple hands in a single move by 'connecting' with existing tiles on the board. Assuming that all created hands are 'valid' then the move score is the total of all the hands created. A basic example is shown below but the possibilities for this sort of move are limitless. This is how some of the very high move scores can be created! In the following example the tiles which are already on the board are shown slightly dimmed to distinguish them from the currently played move tiles. The vertical and the horizontal are already on the board. To participate in tournaments you must upgrade your QaardZ account to 'premium'. See Premium Upgrade for details. There are 2 types of tournament within QaardZ, they are either 'FREE' or 'PAID'. Free tournaments are free for premium players whereas entry into paid tournaments will cost 'QoinZ' which can be purchased from the 'My Account' section of the app or won by playing in tournaments. The maximum number of games that you can have in a free tournament at any one time is 4 but you can 'buy' more games in the tournament as soon as some of the games are completed. The maximum of 4 games does not apply across tournaments so you can have this maximum of 4 games in each free tournament at the same time. These QoinZ can then be used to 'join' or to 'buy more games' in any paid tournament. Each paid tournament states how many QoinZ are needed to buy a 'ticket' and how many games in the tournament that you will get to play. There is no limit on number of games you can 'buy' in a tournament as long as you have enough QoinZ in your account. The tournament details page shows you how many game credits you have as well as details of pending games, games in progress and games played. The QaardZ server regularly checks each tournament for players who have available game credits and randomly creates games between these players. At this point, 1 game credit is deducted from each player's tournament game credits. If you have joined a tournament then unless there are no opponents to play you will quickly be allocated games to play. The random mechanism used to create tournament games always attempts to create games against opponents you have not played but if not available can pair you against a previous opponent again sometimes. At any time you will only have a maximum of 1 game against any particular opponent within a tournament. If both players do not play at least 1 move within a set time period (default 6 hours) then the game will be deemed to have never started and will be cancelled. In this situation each player has 1 game credit added back to their tournament game credits for the tournament in question. NOTE: The cancellation time period varies per tournament depending on the length of the tournament so could be shorter or longer than this default. If any player does not play their move within a set time period (default 12 hours) then the game will expire and the player who last played a move is deemed the winner irrespective of the game scores. The other play is considered to be at fault for the expiry and as such they forfeit the game. In this case only the winning player's score is registered on the tournament leader board. NOTE: The expiry time period may vary per tournament depending on the length of the tournament so could be shorter or longer than this default. If a tournament game is about to expire or be cancelled, a warning push notification is sent to the player who is to play next advising them of this with indication of how long before expiry / cancellation. If the player then responds and plays their move then all expiry / cancellation time periods are reset. If a game is a draw or a tie then both player's scores will be registered on the leaderboard. If games are in progress when a tournament comes to an end then these games are terminated and the result is whatever the current games scores are at that time. The game is not played to completion and no further moves can be played. if the game is a draw or tie then both player's score are registered on the leaderboard. The QoinZ prize fund stated for a particular tournament is the total of all prizes to be paid out for that tournament. First place receives 50% of the prize pot, second place 30% and 3rd place 20%. In the event of positions being tied then the prize fund is shared by the players to ensure that total prize fund is not exceeded. Each tournament details page displays the current state of the tournament leaderboard. Each entry shows the player, their highest score and their rank / position. If multiple players share a rank / position then the display order in the list is not relevant. The tournament details page and leaderboard can also be accessed directly from tournament games using the tournament button on the bottom right of the screen. If for whatever reason a tournament comes to an end and a player is left with remaining game credits then the QoinZ 'value' of these game credits may be refunded to the player's account subject to conditions. Since the game credits do not always precisely relate to an exact number of QoinZ a value is calculated which represents the cost in QoinZ per game. This value is used to calculate the QoinZ value of those game credits and this value is then rounded down to the nearest whole number and refunded to the player's account. Details of the refund will be sent to the player via a push notificaton and will also appear in the player's account details on the website. QaardZ will pay prize funds to the winning player(s) as soon as possible after tournament end but not later than 7 days later. The QoinZ prize fund will be transferred into the winning player's account and they will be notified by email. An announcement will also appear on the QaardZ game home page showing the 1st place winner(s). Please refer to the Terms & Conditions section for precise details. When a player first registers to play QaardZ their account is initially of type 'standard'. Maximum of 4 games in progress at once. Maximum of 4 open invitations. No access to play in QaardZ tournaments. NOTE: Invitations expire after 24 hours if not accepted or rejected so that invitations don't stay locked forever when player's don't respond. By upgrading to Premium these limitations are removed. Upgrade is time-limited and can be purchased for 1,3,6 or 12 month periods from the 'My Account' section of QaardZ. This uses the In-App Purchase system for your device's platform, either App Store on iOS or Google Play Store on Android. Removal of popup adverts in QaardZ. Maximum of 30 standard (non-tournament) games in progress at once. Maximum of 20 open invitations. Access to QaardZ tournaments, both FREE and PAID. Additional QaardZ 'products' in 'My Account' section to purchase QoinZ to spend on tournaments. The expiry date of the Premium Upgrade can be seen on the 'My Account' page in QaardZ. When the Premium Upgrade expires the account will revert back to 'standard'. Any existing tournament games which have been registered can be completed but no more tournaments can be joined unless account is upgraded again to Premium.